It’s that time of year when we get all manner of Halloween slots to try out for the first time. And what better figure to have in said slots than Dracula himself? Barcrest has come up with a cracker of a title in the Ooh Aah Dracula slot, but will it deliver scares and prizes in equal number? 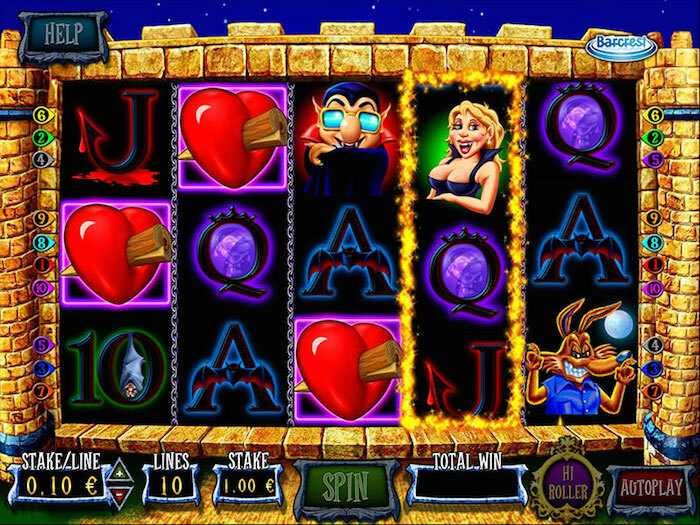 The Ooh Aah Dracula slot is a 5 x 3 online slot game from Barcrest. As you might guess, the theme here is ideal for Halloween, and it features all the symbols and images you might associate with Dracula – not least of which is his castle. While the game is based on a frightening figure, it’s been designed to be nice and bright and is a lot of fun to play. It takes on a cartoon appearance – think of it as ghoulish but friendly and you’ll get the idea! Okay, let’s get down to the graphics. We’ve mentioned a bit about these already, but it’s worth noting here that the detail is extremely impressive. There are chains hanging down between the reels, and the entire game is set at night in part of Dracula’s castle, by the looks of it. As for playability, you’ve got the usual controls built into the foot of the game screen. You have to play all the lines but since there are just 10 of them this shouldn’t present you with a problem. Click on ‘help’ in the top-left corner to access the payout table. This has nine pages, and it’s worth exploring them all. The game has more features than you might initially expect. The main symbols are the logo for the game (this delivers the biggest 5,000-coin prize for five) and Dracula himself. He will grant you a 1,000-coin prize for getting five on a payline. Even though the other symbols include the A, Q and J-type ones, they are made to look relevant. The crossbar on the A is made up of a bat, for instance. The 4 hearts Stake It or Leave It spins give you 15 freebies to start, and an additional wild. At the end of those spins, you can take the prize or opt to have another 10 free spins with two additional wilds to try and win more. If you get the 5 hearts Super round, you get exactly the same as the 4 hearts freebies to begin with. However, if you exchange and play through the second set of 10 free spins, you get another choice at the end – to take the prize or get another five free spins with three additional wilds added in. When you get to any free spins feature, you will see a Best Strategy Indicator appear. This is depicted by a skeletal arm sticking out of a grave (well, of course). Watch to see where it leans to. If it’s leaning to the left, your best strategy will be to collect your winnings. If it’s leaning to the right, your best bet is to play on. However, you should note this isn’t guaranteed. It’s up to you whether you take the advice given. The return-to-player varies in this game, as you’ll see below. But before we get to that, let’s explore the Hi Roller bet feature. Here you have a chance to play five consecutive spins for a set price. This is either 20 or 30 coins and in each case the RTP is higher. If you manage to trigger the free spins option in either of these games, you will go through to the Graveyard Bonus or the Super Graveyard Bonus respectively. These occur once you’ve played your free spins. In each case, the Graveyard Bonus allows you to choose from a number of graves to reveal how many ghosts are within. You get a prize for each one. There’s a big difference in the smallest and biggest bets here. You can wager a mere 10p if you like, or you can crank it up to £500. Your top prize is 5,000 coins for five logos on a line. However, the paytable indicates a single game will pay out no more than 250,000, so you can win more. The basic RTP is 96% when the best strategy is in play. However, if you choose to play the Hi Roller game, you can increase this to 99%. This does involve a much bigger bet though. For our money, we’d say you should definitely add the Ooh Aah Dracula slot to your list of the latest Halloween online slots to play. It may not be scary, but it is packed with cool features.